Now, onward into the past. Turn first right, ½ a mile past the church onto the wee road wiggling its way back to Rhynie, a scenic route between little knobbly hills and cow-meadows. 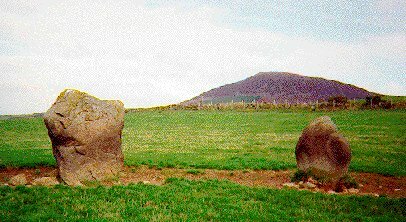 Pass the Wheedlemont hill fort, and Templand, a common place name usually meaning a history of Knights Templars, or the old "Druids Temple", in other words a stone circle. 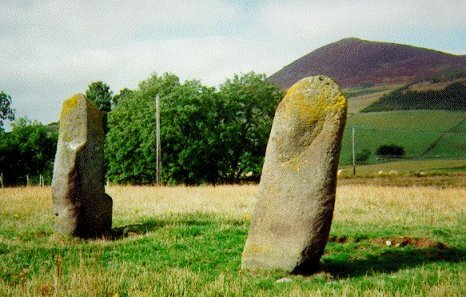 There are only a couple of stones left at each of the Wheedlemont circles seen from the right of the road, at Upper Ord from the left, and going back through Rhynie, two more tall stones at Mill of Noth, probably flankers, all visible from the road.